If a concrete beam is cast with reinforcing rods made of an SMA material, these can then be "activated" through the application of heat. They attempt to return to their original shape, but because of their concrete sheath they cannot do so, thus exerting a pre-stressing force on the beam. This effect can be used, for example, to pre-stress a complete bridge span. In order to generate the necessary force the SMA rods must simply be heated by passing an electric current through them. This obviates the need for using elaborate tensioning systems and jacket tubes, as used in conventional pre-stressing techniques. The nickel titanium alloys used to make spectacle frames or stents are not very suitable for use in the construction industry. Iron-based SMA products are much more attractive, since both the raw materials and the processing costs are far cheaper. However, to date one problem has remained a stumbling block: to activate the memory effect the materials currently used must be heated up to 400° C, which for applications involving concrete or mortar, or other heat sensitive materials, is too high. 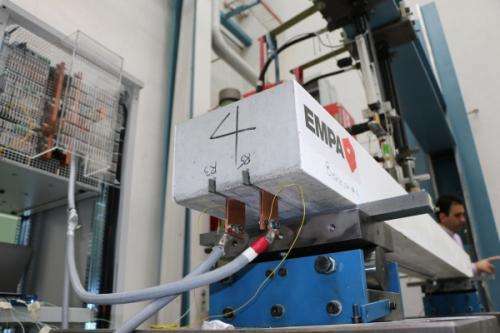 Empa researchers led by Christian Leinenbach of the Joining Technology and Corrosion Laboratory have now succeeded in developing a novel iron-manganese-silicon SMA alloy which is activated at just 160° C, a temperature much more suitable for use with concrete. The material science researchers "designed" a range of virtual alloys using thermodynamic simulations, and then selected the most promising combinations. These were then manufactured in the laboratory and their shape memory characteristics tested, with great success. Several of the new materials met the construction engineers' requirements, an important milestone on the path to providing economic shape memory steel alloys for industrial applications – in other words, manufacturing them by the ton. 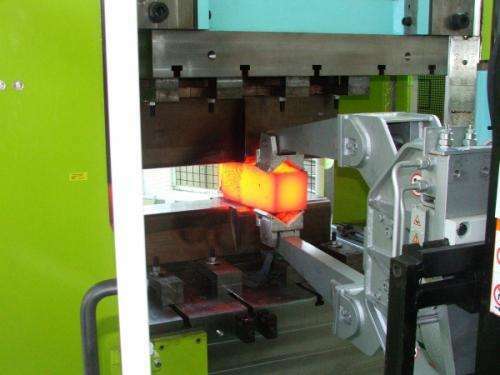 The working of cast ingots, each about 100 kg in weight, into thin strips around 2 mm thick or ribbed armouring steel rods at temperatures over 1000° calls for high degree of technical knowledge, and the appropriate infrastructure. The working process also needs to be adapted for use with the novel alloys. The metal strips produced in this way demonstrated their capabilities in the tests which followed, during which they were inserted into slits cut in the surface of concrete beams and fixed with adhesive. To carry forward the developments made at Empa, a start-up company, re-Fer AG, has been set up. This will in future produce and distribute iron-based SMA for the construction industry. The cost of the new products is expected to be about the same order of magnitude as that for stainless steel based materials. I can see how this would be useful, but glasses isn't one of those areas. Frames require heavy adjustment (ie, bending) by opticians upon being dispensed to a patient, otherwise they won't work properly. This is especially true of frames with progressive lenses ("no-line bifocals"). If the frames can't be adjusted to fit the unique headshape and nose of each person, they aren't particularly useful. So... yeah. The people who wrote this article should have at least googled the stuff they spewed out before they published it. Some minimal amount of pre-publication research is a great thing:P.